Well, this is just typical. A young man awakens an ancient horror and sets it loose to prowl the countryside and spread havoc and despair, and as soon as he’s done it, he decides he didn’t mean it and he wants to take it back. I guess there were irresponsible millennials back in the nineteenth century too, eating avocado toast and not buying houses. So this is it, the new monster; it’s tall and angry, and it doesn’t have a head. This is the bottom of Judah Zachery, condemned wizard of the late seventeenth, who was forcibly separated and scattered around to no tangible avail. When he was alive, he was just one guy, casting spells and ensorcelling people one at a time. Then they cut his head off, and now there’s two of them, just as dangerous as before. A few weeks ago, the head attacked old Ben Stokes, making him commit suicide by cutting his own head off. Then it glommed onto Desmond Collins through his dreams, telling him to find where the body was buried, and dig it back up. Desmond ran it to ground here, in this old cemetery, in a metal coffin pinned down by an enormous wooden cross. Desmond hired a sailor, Tim Braithewaite, and asked him to move the cross and liberate the casket, while Desmond went out to rent a cart, and buy a whole bunch of gluesticks which he figured he might need later on. And then all hell broke loose, out of the coffin and up from the depths. Now, you’d think that the body would be thrilled to get up after all these years, and it would probably want to thank the guy who freed it, right? At least he buys the next round of drinks, is what I’m thinking, but apparently not. The body gets up, and the first thing it does is decapitate Tim with its bare hands. I’m not sure how that gets accomplished; this story point depends on people being equipped with a particular kind of snap-top human head that can be pulled off the neck at whim. Personally, I would imagine that pulling a person’s head off would require at least a couple of hours and an instruction manual. You could yank an arm or a leg out of the socket if you want one, but necks are really good at staying attached to people; it’s kind of what they’re designed for. But the deceased Judah Z seems to be able to do it in seconds, without even looking. There must be a trick to it. Anyway, Desmond comes back with the cart and finds Tim lying on the ground disassembled, and all of a sudden he realizes that being in thrall to a severed head has a messy downside. “It’s gone — gone!” he gasps. “What did I do?” He pauses, to think it over. “The Bedford Atrocities!” he cries. “It’ll kill us all!” And all of a sudden, he’s on our side again. So I don’t know, I guess at this point I should stop expecting this story to make any kind of sense. Up until now, Desmond has been the only character who actually understands what’s going on with the Head of Judah Zachery plotline; everyone else just stands around and asks him questions that he refuses to answer. But now Desmond is confused too, which doesn’t leave us with a lot of room to maneuver. Desmond wants to destroy the head, except it’s not there anymore; the credenza has been swept clean. His theory is that the body must have broken into the house somehow, silently making its way through the halls using echolocation and situational awareness, and carrying off both the head and the glass case it’s housed in. I imagine the body is probably holding the glass case up on top of its neck with both hands, running around outside and making vroom vroom noises. At least, that’s what I’d be doing. This is the direction the show has been going for a while, constructing horror stories using bizarre nightmare logic to stagger from one visual set piece to another, with no real attention paid to consistent motivation or audience engagement. It’s the same kind of narrative fugue state that gave us Dameon Edwards and Claude North, but this time with a less attractive guy. It’s cute, it’s like he thinks they’re Sheriff Patterson and Dr. Woodard, like they can still while away an afternoon pretending there isn’t a monster outside. Those days are over. Desmond insists, “Quentin, I came to you because you have an interest in these things! You accept the fact of unexplainable happenings!” Desmond’s tousledness is reaching escape velocity; at a certain point it stops being tousled and turns into a whole new type of hairstyle. Desmond asks, “What can we do, Quentin?” and then looks at him, because the handsomest man in the room gets to make all the decisions. “We’ve got to find Judah Zachery,” Quentin decides, although personally I still think there’s a question of whether they’re looking for one guy or two. “There must be a way! '” Quentin says, heading for the armory, which is in a drawer two steps away from where he was just standing. 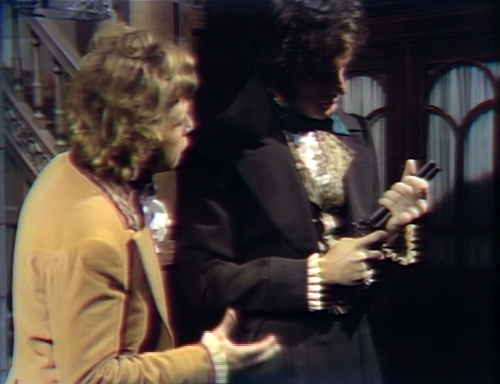 As you know, every drawer in Collinwood contains at least one loaded revolver; housekeeping has a regular maintenance schedule of cleaning and reloading them once a week. “Quentin, you don’t know the evil!” Desmond insists, so I don’t know why he was asking in the first place if he’s going to backseat drive the whole time. Either you accept the unexplainable happenings or you don’t; grab a gun, and let’s get out there and pointlessly shoot at monsters. But then it’s two scenes later, and the unexplainable happenings haven’t happened. Desmond and Quentin are standing around in Rose Cottage, with no monster and no gun, reviewing the case. “Desmond, there’s one thing I don’t understand,” says an underestimating Quentin. “If the head was here, how did the body get inside the house to get it?” This is a tricky question to parse, because the head was here; that’s the part that we know. The question isn’t how the body got inside, it’s how the head got outside. Am I the only one keeping track of this? Desmond says that he doesn’t know, and Quentin insists, “Are you positive that you told no one?” This is another trick question. Told no one what? “I don’t think the two are together,” Quentin decides. “I know it!” This telegram arrives from nowhere in particular. And then Quentin says, “All right, I want you to go to bed,” which is possibly the most perplexing line of dialogue in this entirely perplexing story thread. You want what? Desmond says, “I can’t sleep!” and then Quentin says something garbled that I can’t quite catch. It sounds to me like he says, “Now, listen to me, there’s no point in hunting for him [perfect]!” That last word can’t be “perfect”, but I can’t think of how Quentin could end that sentence, either with a word that sounds like “perfect” or in any other way. These two have moved beyond the bounds of human language. “I got rid of it!” Desmond shouts. “What else could I do?” There are a lot of possible answers to that question. So these are the unexplainable happenings, which aren’t getting any more explainable as these two try to explain them. The body doesn’t have the head, as it happens, and in tomorrow’s episode, Hortense finds the body lying on its back in the woods, inexplicably covered in tree branches. She removes a branch, just to see what the hell is going on, and the body sits up and grabs her and rips her head off. When Desmond moves from his scene with Leticia to the next scene with Gabriel, he looks at the camera for his cue to start. When Desmond admits to Quentin that he didn’t give him the real present, Quentin asks “What was it?” too soon, and has to do it again when Desmond finishes his line. When Gabriel rolls into the drawing room in act 4, the carpet behind Quentin is folded over, probably to allow the cameras to pass by. I think I’m missing the dream curse. 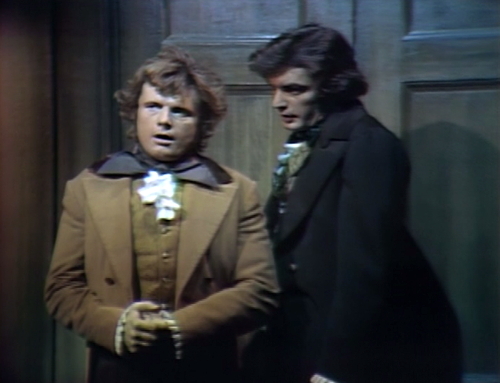 That’s just the kind of Dark Shadows blooper that keeps us all coming back for more. One of my favorite hyperbole lines, in or out of Monty Python. Amazingly, Desmond takes care of Tim’s body, but doesn’t get any blood or dirt on him. I can’t even eat a bowl of chili without getting something on me. I wonder if he cleans clothes for a living? I have noticed that about DS, people can accomplish the messiest tasks without getting a speck of dirt or blood on them. Or even breaking a sweat. So why didn’t The Rest Of Judah Zachery take the mask? Guess he didn’t see it? But the BIG question is, what kind of product is Desmond using to get that much volume in his hairstyle? Must be mousse abuse. I never got that kind of lift when I had an Afro back in the 70s! We need some Angelique. STAT! We also need a lab set-up, which is never complete without technicolor liquids in test tubes and plastic tubes held up by metal frames. Julia needs to get herself in gear on that…there hasn’t been a decent dabble in mad science for far too long. 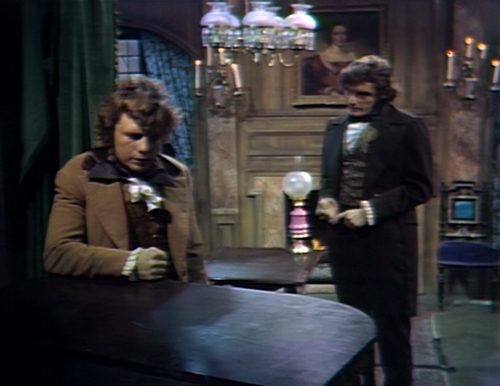 This is the point where evil on Dark Shadows becomes one-dimensional. The darkness of past monsters was always accompanied by a plight to engage the sympathies of the audience: the longing of Barnabas, the loneliness of Adam, the helplessness of Chris Jennings and then Quentin. Petofi had a poetic sense of humor as well as a very real fear to make him vulnerable. Even Jeb Hawkes, born of nothingness, at least would strive to become something. What Angelique did was motivated by love, in the most flawed and therefore human sense. Nicholas Blair was captivated by human temptation. But with Judah Zachery, there is no way to engage the audience, since he hardly even speaks except the occasional threat heard only in dreams. 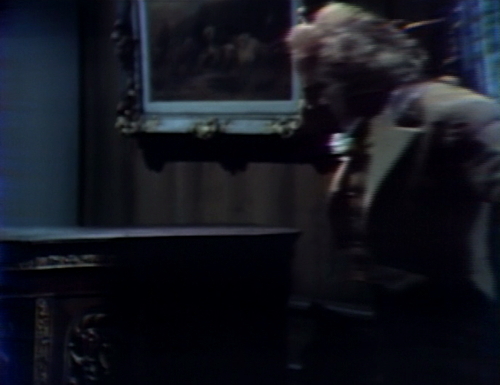 For the first time, a monster on Dark Shadows is made up entirely of uncredited actors. But at least with all that overhead you’re saving on actors’ salaries, it leaves more room for interesting props, like a bejeweled mask. Also, an interesting redressing of the “cave” set. On a side note, the 1840 Angelique is in my top three portrayals of her in the Original Series. She’s brilliant in 1795, a force that powers the storyline along far better than Vicki could ever dream of doing. She’s completely relatable and the best embodiment of a woman scorned. 1840 Angelique isn’t antagonistic, and I like how she enters the storyline. She’s got an entirely believable motivation that shows shock horror character development that in turn triggers character development in Barnabas. Meanwhile the Angelique of the Dream Curse period and Parangelique (that’s Parallel Time Angelique for non-portmanteau-ers) come off as cartoonish supervillainy. They do what they do for the lolz. There were so many more direct or effective ways to ensnare Barnabas in 1967, but the dye from her wig must have seeped into her brain because Angelique went for the most interminably boring method she could think of. 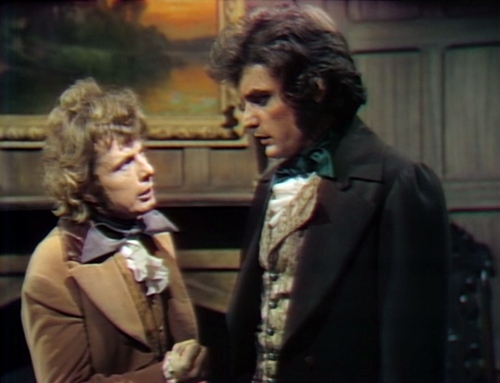 Yes, I like 1840 Angelique, though I do find that 1897 one is my favorite, as she’s just a wild card femme fatale yet an actual ally for the most part to Barnabas and Quentin. Dream Curse Angelique is dull because her aspirations are dull & she is subordinate to Nicholas Blair, which is just unacceptable. “Parangelique” lacks the “underdog” aspect of 1795’s Angelique — they basically make her an evil, adulterous Josette while shifting everything that might’ve made us root for Angelique to “working class” PT Maggie. Angelique – the 1840 model – did start out antagonistic what with her treatment of Roxanne and Julia. She does make a pretty quick turn around though and becomes likable. You’d think that she would be the first person on Juda’s list to destroy. 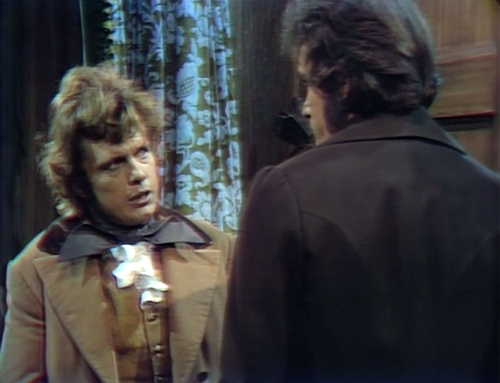 I did enjoy the snarky scenes Cassandra and vampire Angelique had with Nicholas Blair. 1795 Angelique was one to be feared, but 1897 Angie was my favorite because she worked mostly in harmony with Barnabas, Julia, and Quentin; plus I loved seeing her battle Laura, Petofi, and Aristide. What’s tragic, I think, is that Gerard is very much in the mold of previous antagonists you mention. He had recognizable goals and was sympathetic and engaging. Then he’s derailed and all of that tossed aside for a story that might have made sense with his previous characterization. Ideeply regret the waste of Gerard’s potential, too. I would gladly trade Quentin & Daphne’s boring as hell romance and all that silly Leticia and Julia chasing around, trying to reassemble Judah for more drawing room scenes with Gerard, Samantha and Gabriel. Another fun and completely do-able conflict would have been Samantha vs. Angelique. Samantha finds out Angelique is responsible for Roxanne’s death – and all hell breaks loose. But unbeknownst to Samantha or Angelique, Judah/Gerard intervenes on Samantha’s side – to level the playing field. ^ That would have been a grand story! The pirate backstory was jettisoned as well, which could have made this storyline a lot more interesting. 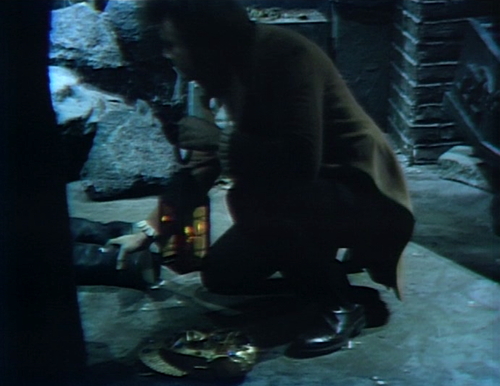 Maybe Gerard was playing the long game and it was his pirate comrades who attacked the boat, giving Gerard an in at Collinwood while taking Quentin, a known dabbler in the occult, out of the picture. It’d address how the characters have become increasingly Collinwood centered, and despite being set in fishing town there wasn’t much nautical material seen. Besides, what can’t be improved with a bit of yo ho ho and a bottle of rum? Hear, hear, Prisoner–the one-dimensional, impersonal, arbitrary evil, like a diablos-ex-machina, is one of the definitive signs of decline; we’ve moved from Jane Eyre and the Crucible to TheThing That Wouldn’t Die, and the emotional stakes shrivel. Despite the show suffering in so many aspects all around her, Lara Parker as Angelique looks more radiantly beautiful than ever in these 1840 episodes! So Quentin, builder of a Staircase Through Time, who told his wife the other day that he tried to contact her telepathically, stout believer in all things occult, suddenly decides to be the “there must be a logical explanation” voice of reason? Can’t accept the idea of a disembodied head (or a disheaded body) with evil intentions? Come on, it was in all the papers! Doesn’t Donald look tired to you? That’s of course one of the strange attractions of weird shows with regular characters – you’re both entertained and annoyed at people who deal with something fantastic one week, then laugh at the idea of something else fantastic the next week. That’s also one of the attractions of weird anthology shows – with them, you DON’T run into such a thing. 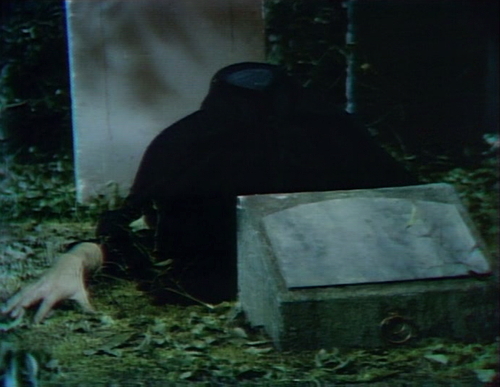 in tomorrow’s episode, Hortense finds the body lying on its back in the woods, inexplicably covered in tree branches. She removes a branch, just to see what the hell is going on, and the body sits up and grabs her and rips her head off. 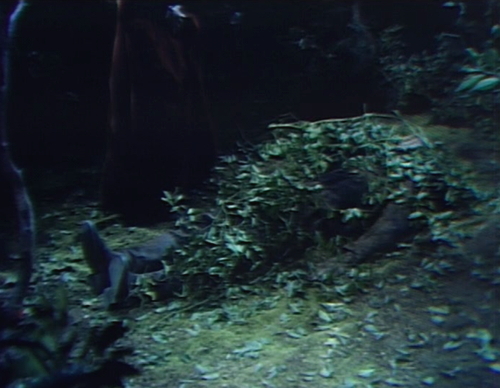 The imagery of a headless body attempting to camouflage itself with branches and leaves makes me chuckle.